The fundraiser is to support awareness of Go Gold for September Childhood Cancer Awareness month. 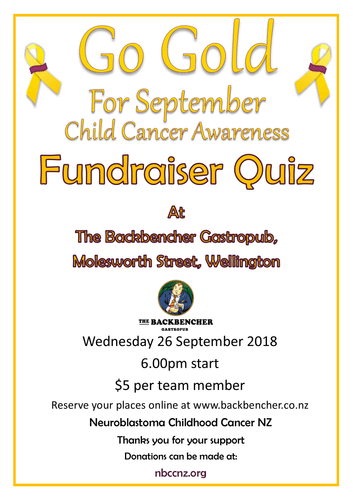 Hosted by the Backbencher in aid of Neuroblastoma Childhood Cancer NZ, you are invited to come and join in an evening of fund and intellectual challenge with some awesome prizes available for Silent Auction. Go to the Backbencher Facebook (@backbencher.co.nz) page for more information about the event. Call 04 472 3065 to reserve places for your team!